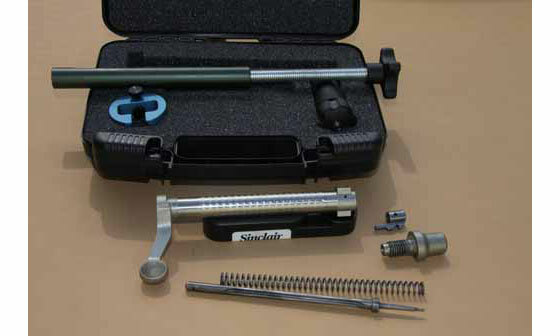 The kit includes a firing pin removal tool, mainspring tool, ejector spring tool and bench blockâ€”all in a handy black plastic foam-lined case to house the tools. As someone who's not mechanically inclined, I've always shied away from doing too much tinkering on my guns, lest I have to go hat (with small parts) in hand to the local gunsmith and ask him to rescue me. But when I learned that Brownell's/Sinclair was offering a bolt maintenance kit with all the tools I'd need to strip down the bolts on my Remington 700s, I jumped at the chance to try it out. If you're a Remington 700 owner and want to be able to keep your rifle in top condition or want to DIY replacement of the firing pin and its spring, or mess around with the ejector, give this new tool kit a look. Stock number is 749-011-311. $110, Sinclair International.